The rivers have carved deep valleys through the Antrim Mountains to the sea. 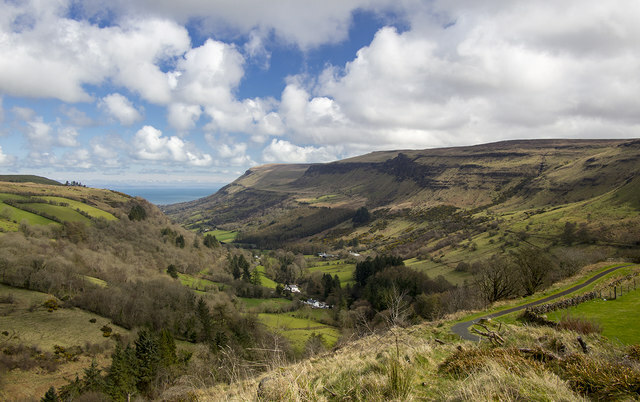 Celebrated in song and verse, the Glens of Antrim used to be the wildest and most remote part of Ulster. This region was not ‘planted’ with English and Scots settlers in the 17th century and was the last place in Northern Ireland where Gaelic was spoken. Today the Antrim coast road brings all the glens within easy reach. Glenariff Forest Park contains some spectacular scenery. The main scenic path runs through thick woodland and wildflower meadows and round the sheer sides of a gorge, past three waterfalls. There are also other, optional trails to distant mountain viewpoints. Thackeray, the 19th century English novelist, called the landscape ‘Switzerland in miniature”. Glenariff Forest Park is a must see attraction with spectacular views and well worth a visit on your tours of Ireland.